CLICK on the IMAGE for a larger view with title and description or to make a purchase. © 2019 Jerry Geist. All rights reserved. Extraordinary photographs of Wyoming scenery are found in these galleries. 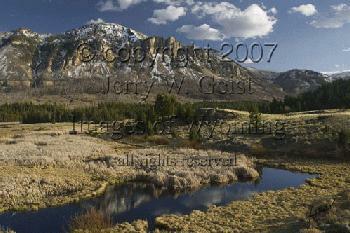 Fine-art Giclees are available of the Wyoming images. See images of wildlife that freely roam the state. This is Wyoming outdoors. Wilderness photography and great Bison pictures permeate the site. If you love nature, wilderness, the outdoors and exceptional images from the west, especially Wyoming, welcome to Images of Wyoming - the photographic art of Jerry W. Geist. The photographic art of Jerry W. Geist website, Images of Wyoming includes galleries of wildlife, landscape, wildflower, sky photos, Yellowstone, and Buffalo. Within the wildlife galleries you will find species that include Black Bear, Mule Deer, Elk (wapiti), Pronghorn Antelope, Bighorn Sheep, Mountain Goats, moose, coyotes, marmots, Bald Eagles, Trumpeter Swans, Sandhill Cranes, Canada Geese, Mounatin Bluebirds, Stellars Jays, Meadowlarks and Pheasant. All photographs are of wild, free roaming animals that are found throughout the state of Wyoming. Landscape galleries include the badlands and red rock country, the Bighorn mountains, the Beartooth and Absaroka mountains, the Cody-Northfork area, Devil's Tower National Monument, Pole Mountain and Vedauwoo, Snowy Range and the Sierra Madres, the Tetons and Jackson Hole, the Windriver mountains and the Pinedale areas of Wyoming. Also featured are the Red Desert and special categories like fall colors in Wyoming (autumn colors). The Sky photo categoy is broken down into the Aurora Borealis or Northern Lights, God beams and Sundogs, rainbows, lightning and storm clouds, susnset skies and moonscapes, those special scenes or wildlife pictures with the moon as a key element. A dedicated Buffalo Gallery is featured, remembering the significant role these creatures played in early western history. A featured print section of the galleries highlights a special edition print called 'The Decimation's Haunting Specter.' It is a remebrance of those terrible days in our frontier history when the great American Bison herds were nearly destroyed with the coming of the railroads to the American west. The Yellowstone gallery is broken down into two main sections Landscape and Thermal Features. In this vast gallery you can find images of Mammoth Terraces, Blacktail Plateau Drive, Swan Lake flats, Elk Park, Gibbon Meadows, Madison River, Gibbon River, Firehole River, the Midway Geyser Basin, Fountain Paint Pots, The Upper and Lower Geyser Basins, Norris Geyser Basin, Black Sand Basin, and many of the particularly notable geysers of the park. Some of these include Old Faithful Geyser, the Great Fountain Geyser, Cliff Geyser, Castle Geyser, Grotto Geyser, Beehive Geyser, Excelsior Geyser, Riverside Geyser and Grand Geyser. Many of the parks waterfalls are also pictured including the Lower Falls of the Grand Canyon, the Upper Falls, Moose Falls, Gibbon Falls, Firehole Falls, Tower Falls, Rustic Falls, and Lewis Falls. Several of the Parks hot pools including Morning Glory, Emerald, and Turquoise, plus various features of the parks thermal areas are included in these sections. Don't forget Yellowstone Lake, West Thumb and Lake Junction. These areas have fascinating thermal areas along the lake's shores. There is a special featured section of Jerry Geist promotional prints called 'Wyoming .... still wild' Select images from the galleries are used to create these specially priced images that speak of Wyoming's legacy, it's wilderness and wild creatures. Other places include images made in Colorado's Rocky Mountain National Park, Montana's Glacier National Park, and a couple of select images from a specia trip to the Canadian Rockies in Alberta and British Columbia. All images in these galleries are available as fine-art Giclee prints. Add a spectacular mountain or western scenic landscape picture to your home or office or select one of your favorite species of wildlife to highlight. A large Mule Deer buck or a bugling elk during the rut makes a wonderful gift for the hunter or outdoor enthusiast. If you are fascinated with western history or images that depict the early western frontier, nothing could be more appropriate that the Buffalo or American Bison. Of course the featured print of 'The Decimation's Haunting Specter'- the 2006 Cheyenne Chamber Art Award selection might be your choice. This magnificent 20X30 canvas print is a spectacular piece to adorn the walls of those with a fascination for this magnificent animal and its place in western history. Wyoming is an outdoor photographer's paradise, a place of magnificent landscapes, sprawling scenic vistas, free roaming wildlife of all varieties, wide panoramic vistas, glorious big skies and variety, unmatched in most partf of the country. We are glad you have taken the time to visit our site and see this special place through the eyes of Wyoming photographer, Jerry Geist. May this land of the first national park, the first national monument and the first national forest become a favorite place of yours. Visit the galleries of Images of Wyoming often to see new additions as Jerry Geist continues to create his visions of this fabulous state - Wyoming.